Here is AutoGArrows plugin for krpano. Information about AutoGArrows plugin for Panotour can be found on this page. AutoGArrows - is a plugin for krpano, which makes navigating the tour automatically based on the GPS coordinates of the panoramas. GPS coordinates must be assigned to each panorama. 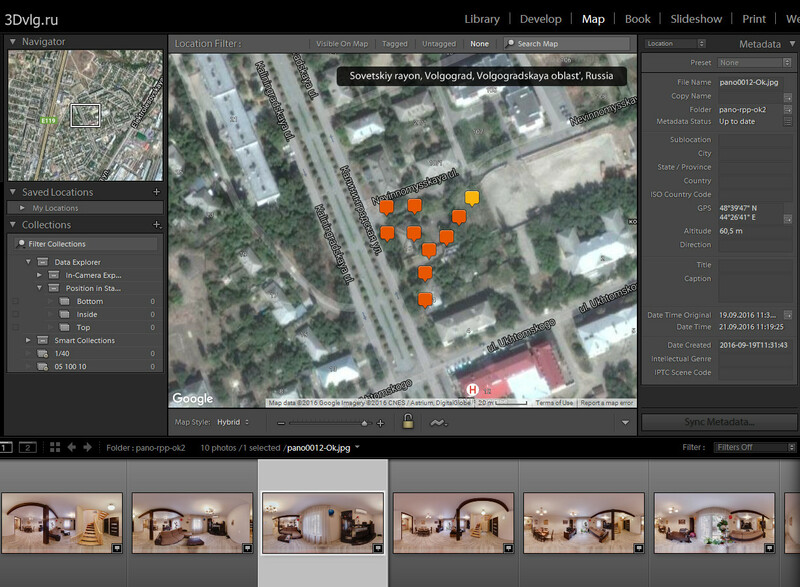 You can use LightRoom, placing the panoramas on the map using MAP tab. Compliance geographic coordinates of the panoramas with actual place of shooting does not matter, the right relative positions of the panoramas on the map is important. If the center of each panorama has a constant bearing on the real North that panoramas are aligned correctly. The presence of the same virtual North in the panoramas is very important for the tours with the routes. For these tours KEEPVIEW mode is required. How to shoot and stitch panoramas with the same virtual North you can find on the Robostitcher's home page. If the panoramas does not have the same virtual North, you need to align them using PTGui or Offset filter in Photoshop. 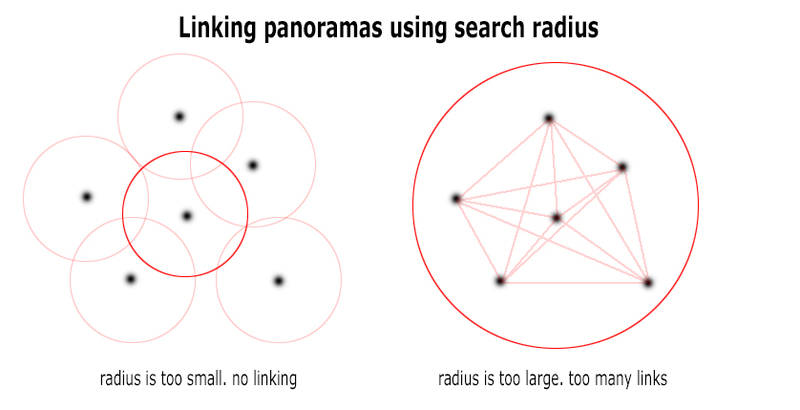 For panoramas taken by spherical cameras you may not align panoramas. Please read information about use_scenes_heading setting below. Build the tour using "MAKE VTOUR (MULTIRES) droplet.bat" for example. Copy autogarrows folder into plugins folder. Before using AutoGArrows you need to modify autogarrows_settings.xml file. search_radius Set the search radius (in meters) within which the panoramas will be considered as neighbors and will be linked. 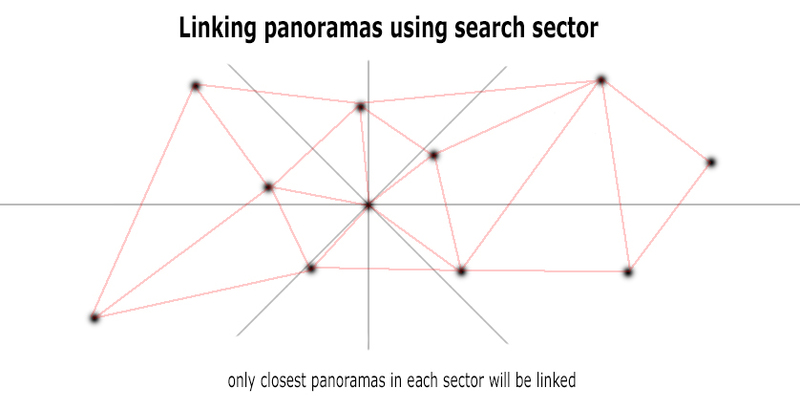 search_sector Set the search sector (in degrees) where the closest panoramas will be considered as neighbors and will be linked (search_radius will be ignored). ath_shift Azimuth correction - the number of degrees which will allow to align the virtual North of the panoramas and the real North on the map (terrain). If after working AutoGArrows GPS analyser arrows are missing, the search radius must be increased. If there are too many, then reduce. Statistics after each run will be a good starting point for more precise radius tuning. By adjusting the radius of the search neighboring panoramas and azimuth correction, you may need to run AutoGArrows GPS analyser several times. After the first run AutoGArrows GPS analyser create batch file (plugins/autogarrows/autogarrows.xml.bat for Windows and plugins/autogarrows/autogarrows.xml.sh for MacOS or Linux) in order not to use the Drag & Drop every time. Just run it after make changes in the autogarrows_settings.xml file. When krpano build the tour it read values from EXIF GPSImgDirection tags and store them for each scene. If panorama was taken with spherical cameras this tag usually contains correct information about panoramas azimuth correction. By default use_scenes_heading is disabled and individual panoramas azimuth corrections are ignored. If use_scenes_heading is prealign (prefer value for keepview'ed tours) then AutoGArrows will prealign panoramas. 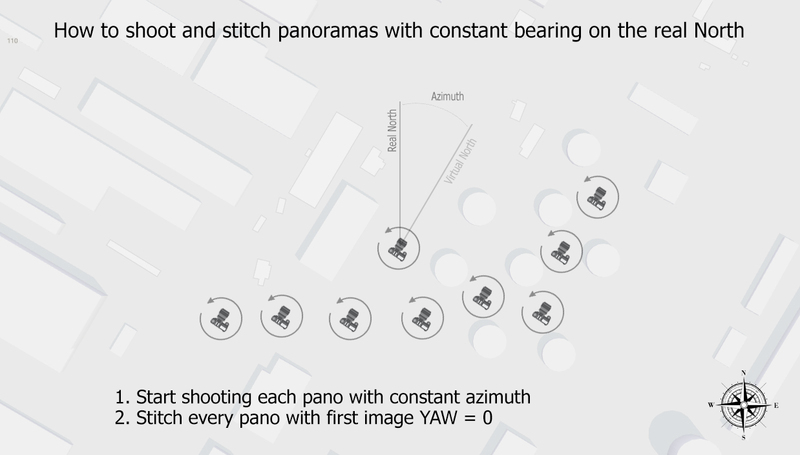 If use_scenes_heading is athshift then AutoGArrows will use panoramas azimuth correction in hotspots ath values and scenes will remain missaligned. Panoramas from some cameras (Samsung Gear 360, for example) do not cantain GPSImgDirection tag, but contain PoseHeadingDegrees wich is the same, but ignored by krpano. In this case you need to use tiny script from panoexif to copy PoseHeadingDegrees values to GPSImgDirection tags before building the tour with krpano. After GPS analyzer has brought satisfactory results you can use it to create tour.xml with liked scenes for you. If create_tour_xml is true AutoGArrows GPS analyser will create tour-autogarrows.xml. You can use newly created tour-autogarrows.xml file instead of tour.xml file and completely remove AutoGArrows plugin from the tour. Ask a question or search for an answer in the official AutoGArrows plugin's group on Facebook. Please PM me with questions about payments and downloads. Fully functional demo versions of the AutoGArrows with AutoGArrows GPS analyzer can be downloaded here. Attention. Since December 20, 2016 Google Drive sometimes began to find "viruses" in the archives of the program and warn of the possibility of infection. This behavior has spread to all AutoGArrows releases, including uploaded before this date. Perhaps the situation will be corrected in the near future, but for now, download, check by local antivirus program and use.